Lisa Fenton is a Certified Supply Chain Management Professional (CSCMP), Supply Chain Manager and an advocate of championing women back to work with a focus on negotiating beyond salary. Lisa enjoyed twelve years with her three boys at home in Bowmanville before going back to work. Lisa ‘s website www.propelledbypossibility.com features published articles on her journey back to work,an interview on success strategies to return to work along with a link to a podcast “Creating an Effective Return to Work Plan” with Lisa Fenton,CSCMP. Dan Van Brunt is a Senior Director of Technology @KlickHealth (klick.com) based out of Toronto, Canada. He also writes about cloud solutions, serverless and infrastructure automation. When he is not tinkering with his personal home automation projects, he is also an active contributor to a number of related open source projects. A proud learner for life and gadget freak. Incorporating TDD can often be a perilous and ill-advised expedition. Let’s undertake the journey together by navigating through firsthand experience at a former start-up. The important lessons learned from your fellow adventurers will prepare you for the expedition of a lifetime! Tuti Aniyi is a software developer who focuses on using technology to build quality products. With a passion for storytelling through various mediums, she currently champions quality & knowledge sharing initiatives at Shutterstock Custom. Additionally, she partners with organizations to drive social impact through technology; her varied experience spans the health, finance, art, media, and non-profit sectors. Join us for the 5th Annual IWDTO Event! In our eight years #DevTO has worked diligently to organize timely, compelling, and engaging events for our tech-minded and developer community. In 2014, we set out to create one of our biggest and most poignant events yet: International Women’s Day Talks (#IWDTO). Five years later #IWDTO is a day we set the stage for women in tech to gather, speak and cheer with their allies. Join 500 people on March 4th for an evening of tech and talks to celebrate IWD 2019! Remember to check out the Company Night Out 10 Ticket Pack to get your team involved this year! P.S. We’d also love a quick post on Twitter. The theme for this evening is lessons learned. We will select 5 people to share a 5 minute story and the lesson they have learned. Please submit your story here. We will make our selections the week of July 24th. Start something fresh this Spring at HackerYou. Learn from upcoming workshops and programs, including Shopify Theme Development, WebPack, React, and Electron. In our six years as a successful monthly meetup in Toronto, #DevTO has worked diligently to organize timely, compelling, and engaging events for our tech-minded and developer community. In 2015, we set out to create one of our biggest and most poignant events yet: International Women’s Day Talks (#IWDTO). A day we celebrate and set a stage for women in tech to gather, speak and cheer with their allies. Past #IWDTO speakers have included talented women in technical roles at companies like Twitter, twilio, Bitstrips, and Mozilla. In March 2017, we renew our vows to support the movement, and hope you might join us too. We’d like to hear from you: we’re opening up a Call For Proposals to women in tech for our #IWDTO event. Are you in North America? Are you available March 6th, 2017? The primary theme is inspiration, with pinches of experience. Given the stage, what would you share with your community? That will be your job. Our job? We will take care of all arrangements from transportation to accommodation. We will also provide a safe, inviting and inclusive space for you to speak and present. Lastly, Toronto is one of the most diverse cities in the world. As the fourth largest metropolitan area in North America, we have citizens from all corners of the globe. It’s important that our speakers reflect the fact. Think It. Code It. Gift It. Are you a coder, designer or someone that loves to solve problems and find solutions? Capital One Canada is kicking of a Hackathon on Friday, October 21, 2016 until Sunday, October 23rd, 2016. Join fellow coders, developers &amp; designers as they problem solve &amp; create solutions for six Toronto-based charities. This is a great opportunity to make a difference in a fun way! Participants will be put into teams of four to six people(or can sign up as a team) &amp; challenged to create a technology solution for one of the charities involved. So come on out &amp; make a difference. It’s going to be hosted by Marc Saltzman at Brainstation in downtown Toronto. This is going to be a great opportunity to meet the developer community &amp; partners of the hackathon. Charities being supported are Blake Boultbee, Holland Bloorview Kids Rehabilitation Hospital, Prosper Canada, Second Harvest, Toronto Pflag and Women’s Habitat. WHY: Support accessibility for technology &amp; innovation for the six charities! WHAT: Hackathon – developers, designers &amp; anyone with ideas come together to solve a problem through technology. WHO: Capital One Canada with support from Hackworks &amp; Brainstation. So come out & support a great & unique hackathon experience while helping 6 charities make a difference &amp; make an impact in your community! See you there. Think It! Code It! Gift It! This post was sponsored by Capital One Canada. By attending this event you are agreeing to abide by our Code of Conduct and Event Agreement. NOTE: #DevTO this month lands on Easter Monday. 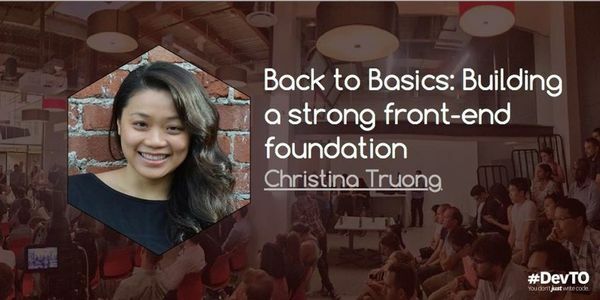 With a decade in the tech industry, Christina has worked at digital agencies such as Teehan+Lax and Razorfish (formerly Nurun). As an educator, she has taught and created curriculum for Humber College and Ladies Learning Code. And as a freelancer, Christina provides technical consulting services and workshops, webinars and coaching for developers. She also teaches BODYPUMP, at Goodlife Fitness, to offset sitting in front of a computer all day. Sketch and Framer have become synonymous with designing and prototyping user interfaces and interactions. Unfortunately, these tools and their formats continue a legacy of unidirectional workflow that disconnects design from development. In this talk I’ll touch on build tools and libraries that allow for bidirectional creation of web experiences while seamlessly documenting our work along the way. 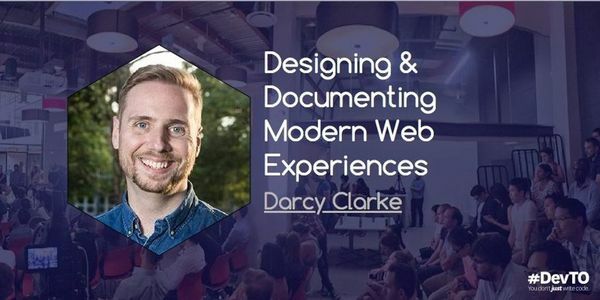 I’m a Full-stack Developer, Designer, Speaker, Entrepreneur, Mentor & Advocate who has been focused on creating amazing User Experiences, promoting web standards/best practices and developing useful tools for the design and development communities across the Mobile, Tablet and Desktop landscapes. I’m passionate about open source and love being involved and engaged with that community.